Posted on March 1, 2015 by E.M.
Super romantic Valentine’s Day with the fiance: he woke me up with a dozen red roses and chocolate (the sea salt caramel chocolate candies from “Trader Joe’s”!) 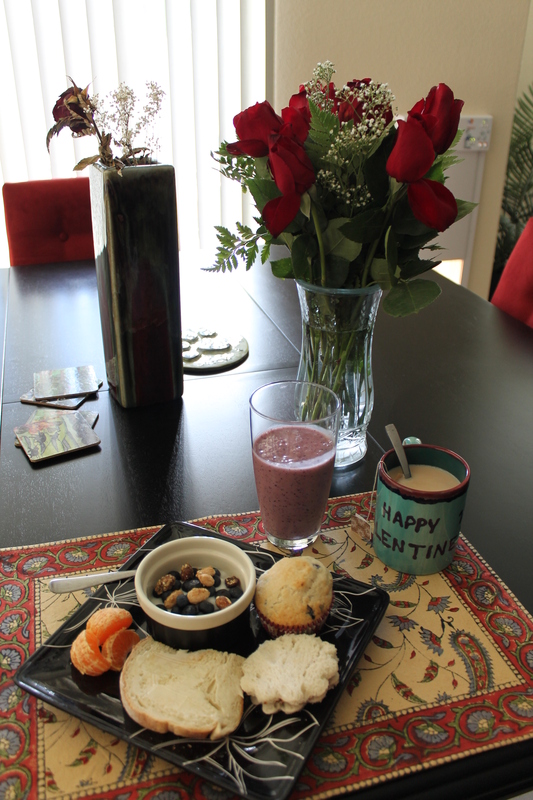 and I made a Brazilian breakfast for him with yogurt, toast with jam, fruit, tea, and a smoothie. At night we celebrated with a glass of champagne at “Napa-Sonoma Grocery Company” before going to “La Vecchia” in its new location. This Italian restaurant has an amazing view of downtown. My lobster was delicious and the fiance’s salmon was perfect. At the end we talked to chef/owner Alberto Gazzola for a bit and he even shared a few secrets with us: the salmon had been done in the pizza oven! Definitely a very romantic place for a date, but the flawless food sealed the deal.